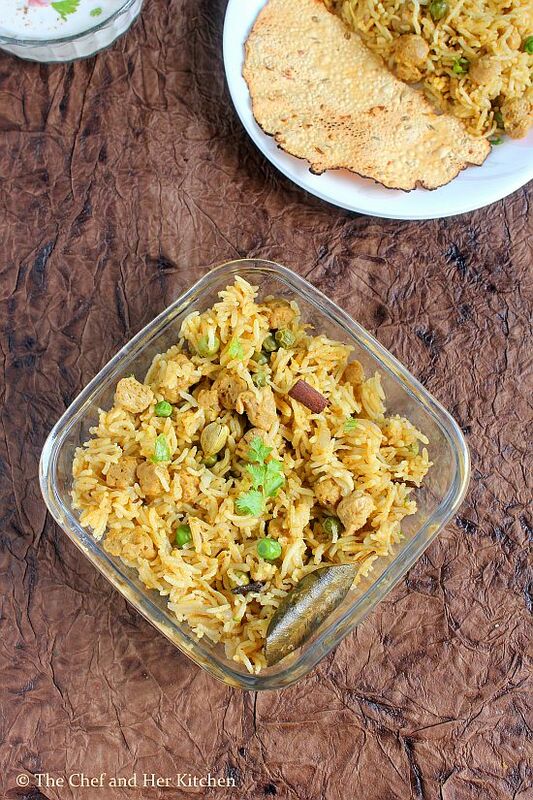 I love Pulaos and Biryanis for the fact that they are one pot meal and can be prepared quickly,while few Biryani recipes are bit complicated and time consuming. I reserve the Dum Biryanis for occasions and always adopt a simple one pot pressure cooker method for daily basis. These kind of one pot dishes are ideal for lunch box or for a week end lunch. I usually add soya chunks even to my vegetable pulaos but in moderate amounts. Soya chunks is also known as 'Nutrela' or 'Meal Maker'.Soya chunks has meaty texture and is a very good source of proteins for vegetarians, hence I include it in many of the gravies and pulaos on daily basis. As Soya chunks are bland in taste you need to spice it up a bit but they observe the flavours beautifully and make the dish delicious. We get soya chunks in two sizes and I prefer to use the mini soya chunks over the bigger ones. I follow more or less a similar recipe for most of my one pot biryanis and love the flavourful outcome all the time. 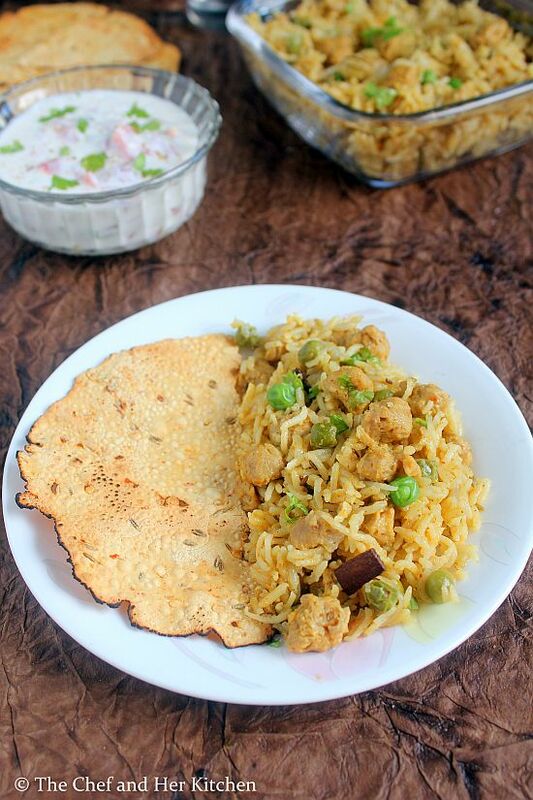 Pair it with Onion-Tomato raita and papad and enjoy the delicious meal with your family. 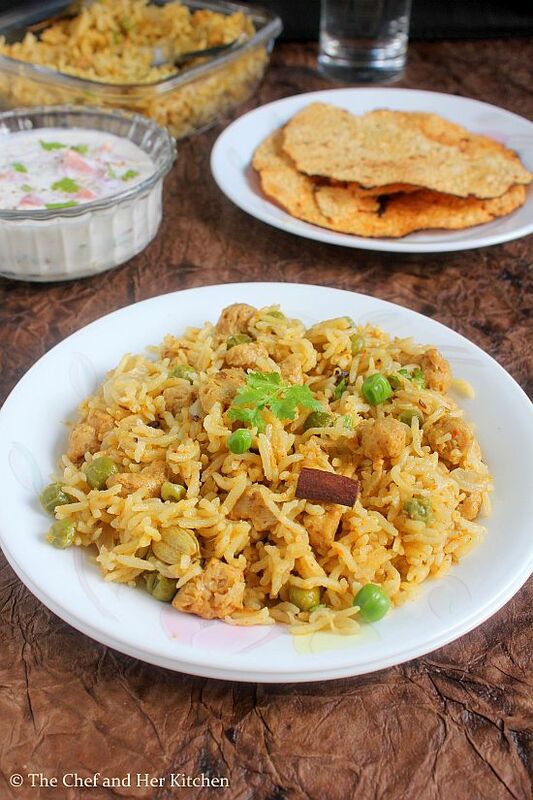 Check out similar biryani/pulao recipes here - Veg Dum Biryani, Babycorn Pulao, Mint Pulav /Pudina Rice, Mixed Vegetable Pulav, Baby Potato Biriyani and Capsicum-Potato Pulav. Grind all the ingredients mentioned under 'to grind' to a smooth paste and keep it aside. Wash and soak basmati rice in water for 10 mins. Boil 2-3 cups of water in a vessel and add soya chunks and boil for 2-3 minutes or immerse in hot water for 7-8 mins.Drain them and drop them again in cold water and squeeze them and repeat the cold bath once again and squeeze them and keep aside.This process ensures to remove the raw smell from soya chunks. Heat oil and ghee in a cooker and add bayleaf followed by shahjeera, cloves, cardamom and cinnamon and fry for half a minute. Add sliced onions and fry well until they turn pink color. Add green peas and boiled and squeezed soya chunks and fry well for a minute. Now add ground masala and fry well for 2-3 minutes until the raw smell disappears. Now add turmeric powder, red chili powder or Garam masala(or biryani masala) and fry for a minute again. Add soaked and drained basmati rice and fry for a minute until the moisture in the rice dries.Do not roast for long as the rice would break. Add coconut milk to it, mint leaves and salt and bring it to a boil and cover it and pressure cook for 1 whistle and simmer it for 7-8 mins.Switch it off and let the pressure drops on its own.Fluff up the rice with a fork. 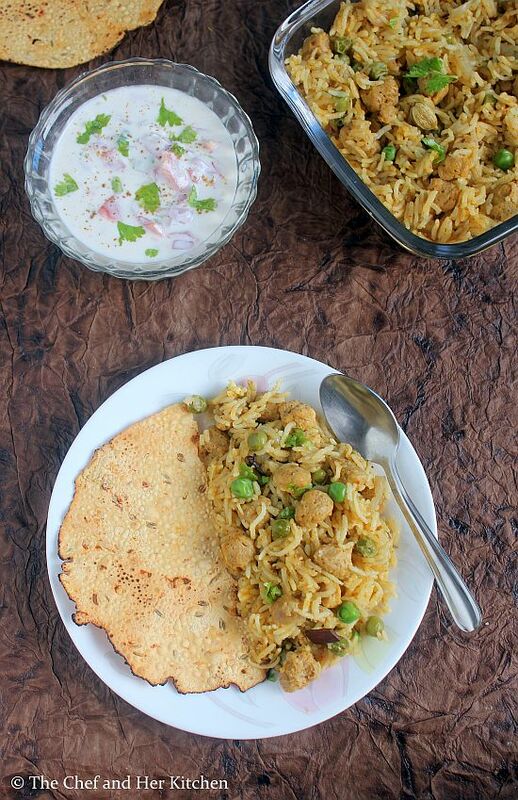 Serve it hot with Tomato-Onion raita and papad. If you use tinned Coconut milk which is of thick consistency you can dilute 1 cup of coconut milk with 1 cup of water to get 2 cups of thin coconut milk.You can even mix coconut milk powder in hot water to get the desired consistency as mentioned on the pack. You can use water instead of coconut milk in the recipe. In that case I recommend you to add 2 tbsp beaten curd before adding water and fry slightly. Along with soya chunks,you can add vegetables like carrots, beans, potatoes, cauliflower, capsicum and reduce the quantity of soya chunks in the recipe. 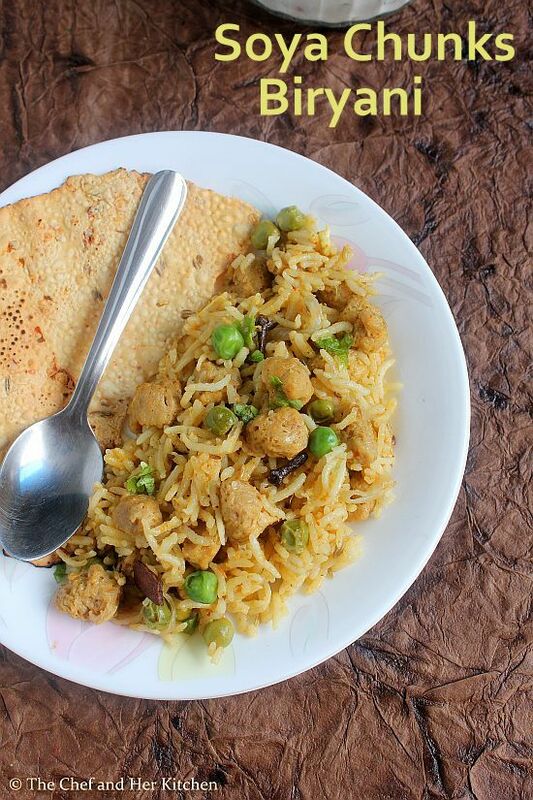 Beautiful biryani Prathy! A good way of adding protein to your rice dishes. I literally take prints or bookmark every recipe of yours to try because I am sure its going to come out well. REALLY A TASTY AND DELICIOUS BIRYANI ,WELL PRESENTED BY YOU. Hi Pratibha, I have a suggestion. Deep fry long cut onions to slightly more than golden brown, in good quantity. Sprinkle these over cooked biryani and cover the same so the flavour of these fried onions is absorbed by the rice. 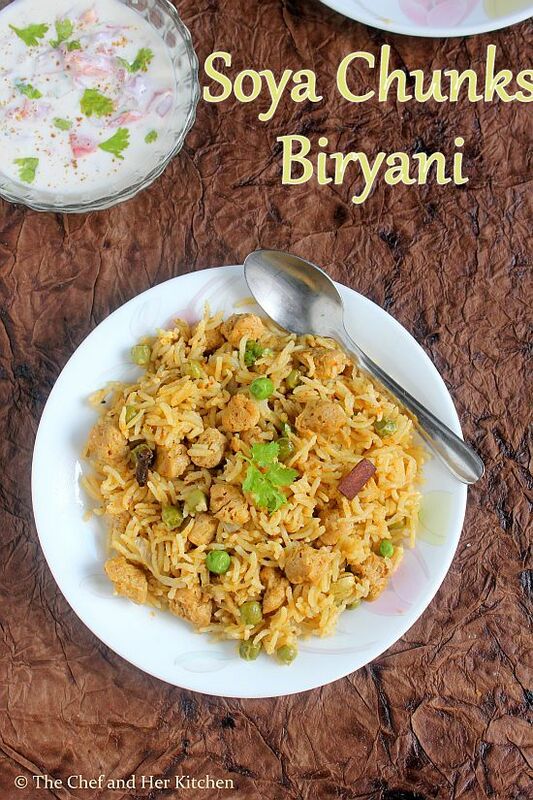 This highly enhances the aroma and flavour of soya biryani.